The Vail Public Library will host free community paper lantern making workshops on Dec. 15 and Dec. 22. VAIL — For a second season, Vail residents Vicki and Kent Logan have joined forces with Triumph Partners to bring even more ice installations to the seventh annual Triumph Winterfest in Vail. With two installations scheduled for this winter season, Art in Public Places is pleased to open Logan Luminescence in conjunction with the Vail Holidaze tree lighting at 5 p.m. on Dec. 22 in Slifer Square, by the Covered Bridge in Vail Village. • Logan Luminescence in Slifer Square by artist Thomas Barlow: This first installation of the seventh annual triumph Winterfest will include 70 cylindrical ice lanterns in varying dimensions, which will transform Slifer Square into an ice and light installation. Enjoy the unveiling of this exhibition, along with hot chocolate and entertainment at the Vail Holidaze tree lighting on Dec. 22 from 5 to 6 p.m.
• Paper lantern making workshops at the Vail Public Library: Art in Public Places is partnering with the Vail Public Library to host free community paper lantern making workshops. Local artist Helen Hiebert, author of the books “Paper Illuminated” and “Playing with Paper,” will instruct participants of all ages on how to create your own paper lantern. Join the Vail community by bringing your paper lantern to the tree lighting on Dec. 22 at 5 p.m. for all to enjoy. LED battery lights will be provided courtesy of our sponsor, so you can illuminate your paper lantern at the Vail Holidaze tree lighting. 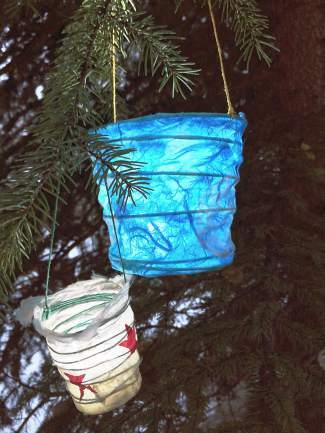 Paper making lantern workshops will take place in the community room at the Vail Public Library on Dec. 15 from 3:30 to 5:30 p.m. for ages 13 and older and Dec. 22 from 2 to 4 p.m. for all ages. Space is limited. Reserve your spot by calling 970-479 2344 or emailing meppard@vailgov.com. Children’s book drive for Colorado flood relief: Art in Public Places with the Vail Public Library are coordinating a book drive for Colorado flood relief this holiday season. A donation of a gently used or new children’s or pre-teen book is appreciated if you participate in the paper-making workshops. Drop-off locations will also be located at the Vail Public Library, the Town Municipal Building, and the Vail Public Works Department from Dec. 1-22. Arches by Paul Wertin on the Gore Creek Promenade: Starting Jan. 17, travel through large-scale, undulating walls of ice that fade into arches along the Gore Creek Promenade. Inspired by Christo’s environmental installations, Wertin is transforming the landscape along the Gore Creek Promenade to create an interactive experience for all ages to enjoy. This is Wertin’s second solo appearance at the Triumph Winterfest. Wertin’s 2013 installation, AlpenGLOW, consisted of 19 ice sculptures. The sculptures fused geometric and organic shapes with intricate lighting effects, to great acclaim. He also was integral in the installation of last season’s popular Logan Ice Theater, a first-of-its-kind outdoor cinematic film experience projected on ice. The Triumph Winterfest has garnered national media attention and award winning recognition in the public art realm. Previous Triumph Winterfest artists include Lawrence Argent with Scott Rella, Karl Krueger, and Nathan Cox, of Pink Monkey. Information about Triumph Winterfest, Logan Luminescence, Arches and the paper lantern workshops may be found on http://www.artinvail.com or by contacting Molly Eppard, Art in Public Places coordinator, at meppard@vailgov.com or 970-479-2344. For more information about all of the events around Vail Holidaze, visit http://www.vailholidaze.com.